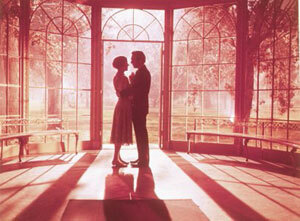 Julie Andrews in the heartwarming true story that has become a cinematic treasure. 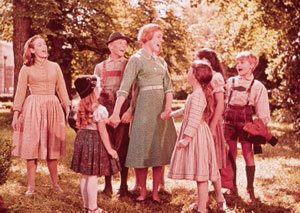 Rodgers and Hammerstein's "The Sound of Music." 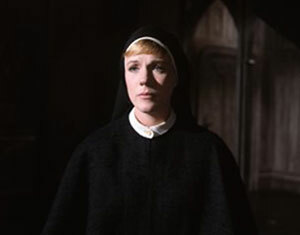 Julie Andrews is Maria, the spirited, young woman who leaves the convent and becomes a governess to the seven unruly charm and songs soon win the hearts of the children and their father but when Nazi, Germany unites with Austria, Maria is forced to attempt a daring escape with her new family. It doesn't matter. 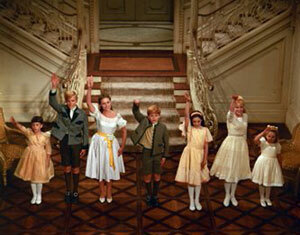 Audiences fell in love with the struggling novice Maria (Andrews), the dashing Captain von Trapp (Christopher Plummer), and, yes, the cute kids, all based on a real-life World War II Austrian family. Such songs as "My Favorite Things," "Do Re Mi," "Climb Every Mountain," and the title tune became part of the 20th century Zeitgeist. In addition, The Sound of Music officially became a cult hit when audiences in London began giving it the Rocky Horror Picture Show treatment, attending showings dressed as their favorite characters and delivering choreographed comments and gestures along with the movie. So why resist, especially when the 40th Anniversary Edition is the best DVD yet. As if the direct involvement of Julie Andrews weren't enough, the 40th Anniversary Edition of The Sound of Music is a must-have for fans because of the fond sense of nostalgia that will touch all but the worst cynic's heart. Andrews introduces both discs and contributes a commentary track on the film. 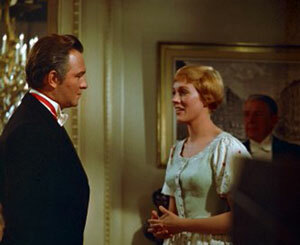 It's a joy to hear her speak about the film (for example, she explains how she solved her dislike for the lyrics of "I Have Confidence"), and also heard are remarks by Christopher Plummer (who at one point refers to his being 48, which if true would mean his comments were made in about 1975), Charmian Carr (Liesl), choreographer Dee Dee Wood, and Johannes Von Trapp (the real-life Maria Von Trapp's youngest son, who admits that his father did have a whistle but claims that he was not as stern as portrayed in the film). Even with all those people involved, there are still significant gaps of silence, however. Retained from the previous two-disc editions is the commentary track by director Robert Wise, which during the musical numbers becomes an isolated score with no vocals. Also new are sing-along subtitles in English, Spanish, and French, which allow you to have your own sing-along at home. In addition, the film's remastering shows off a truer and much warmer sense of color. 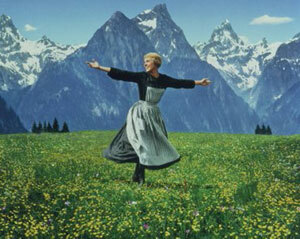 On the second disc, Andrews participates in a new 63-minute documentary "My Favorite Things: Julie Andrews Remembers." But it's really a general making-of documentary with contributions from a number of principals, including director Robert Wise, who died in mid-2005 (not surprisingly, some stories are repeated from the commentary track and from the 87-minute documentary on the previous DVD). Andrews also shares a warm 19-minute sit-down with Christopher Plummer. Carr, who over the years has become the film's biggest advocate, narrates a new 22-minute documentary, "On Location with The Sound of Music," in which she revisits the places in Salzburg where the movie was filmed, and even joins one of the "Sound of Music tours" that have become a booming industry. And acknowledging another big industry, there's a 12-minute featurette on the sing-along phenomenon, focusing specifically on the audience, costumed and otherwise, that attended a sold-out Hollywood Bowl sing-along in 2005. Making special appearances at the event are four von Trapp great-grandchildren and all seven of the actors who played the children. 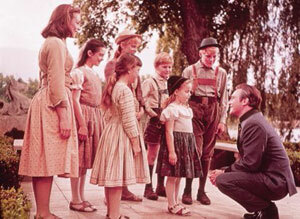 Thankfully, those actors also appear in a 33-minute documentary "From Liesl to Gretl: A 40th Anniversary Reunion," in which they explain what they do now (many are still in show business) and share stories about the film, who was afraid of Christopher Plummer, and what they feel is their responsibility to the film's passionate fans. What's touching is how the group still considers themselves a family so many years later. Other material includes an A&E documentary on the von Trapps, Mia Farrow's screen test for the Liesl role, and a restoration comparison.